Literary Gumbo: Lee Wardlaw from Literary Gumbo on Vimeo. Hay Fever, the children's books wing of the annual Hay Festival, starts tomorrow. 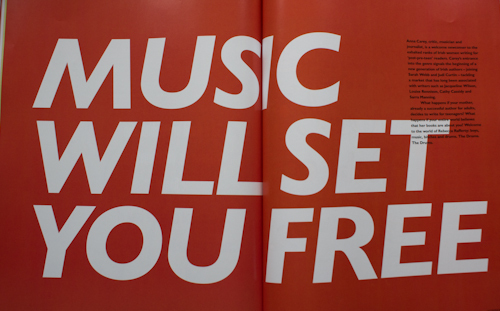 Check the online programme. 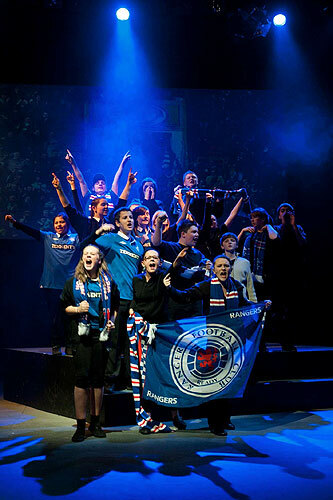 Last night the Citizens Theatre, Glasgow, hosted the world premiere of a musical stage adaptation of the Theresa Breslin novel, DIVIDED CITY, a book which tackles sectarianism on and off the football pitch. 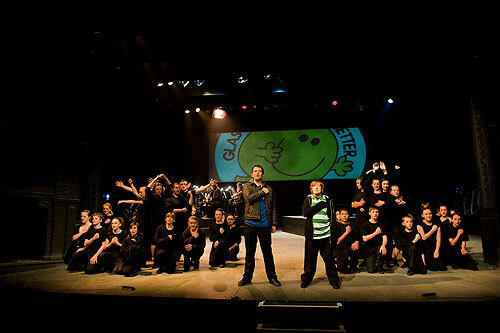 The show was performed by a cast of almost fifty S1 and S2 pupils from schools across the Glasgow area. 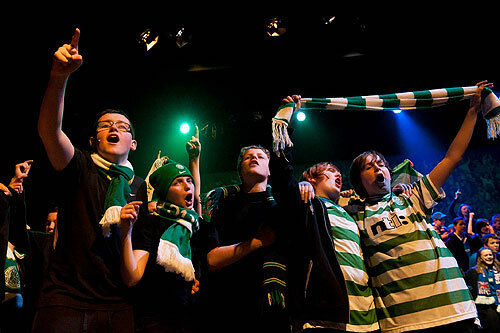 The project, in co-operation with Glasgow City Council's Youth Music Initiative, aims to promote racial and religious tolerance. Two magazines turned up in the ACHUKA postbag this past week. 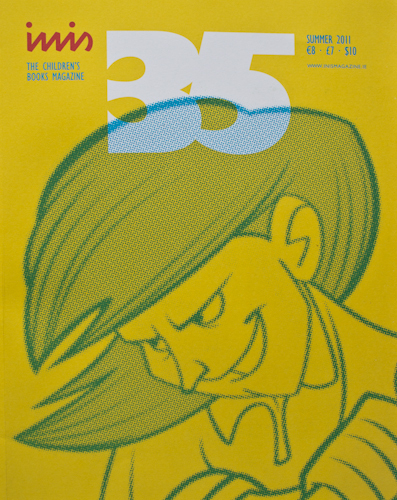 The first, a regular arrival, was the latest issue of Teen Titles, now celebrating its 50th issue. 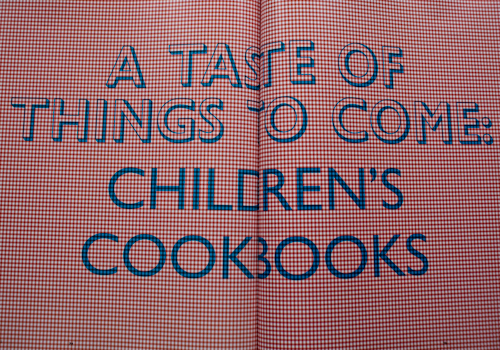 I've followed this magazine since the very earliest editions, and whilst the production values have become steadily glossier, the content of the magazine has remained consistent: bags and bags of reviews (written by teenagers), every page packed with print and colourful book jackets, with just a handful of features or interviews. 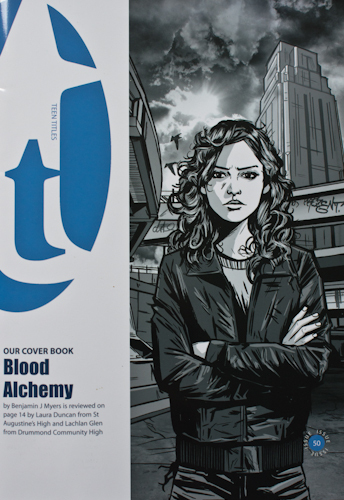 (In this issue the featured authors are A. G. Taylor, Richard Harland, Nicola Morgan and William Nicholson.) 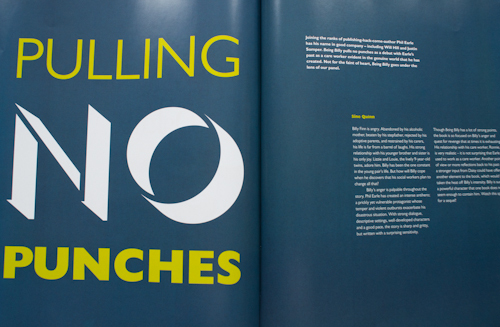 The magazine's 40 pages (including front and back cover) are densely packed with traditional column-design layout. The new-look Inis is a very different beast. For the cover price of £7 you get nearly a hundred pages of highly stylish and glossily presented children's books coverage. 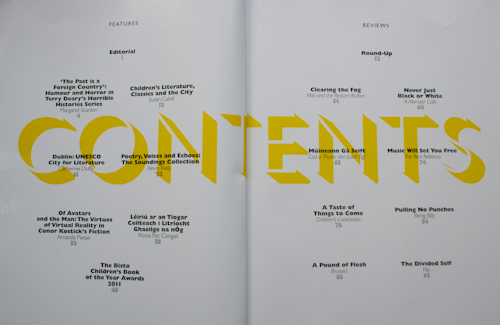 The editors Patricia Kennon and David Maybury declare "We're adopting a whole new look and outlook as the magazine and website positions itself [sorry to be pedantic, but shouldn't that be "position themselves"] within a more global audience." Gone from the magazine are short single-perspective reviews (these still appear on the website). "The reviews will showcase several responses to each book in order to enable a deeper critical discourse and diversity of perspectives." Thus, Martyn Bedford's Flip has three separate review commentaries. The same for Phil Earle's Being Billy. I suspect that this will take a bit of getting used to by those who would usually have anticipated some seventy plus individual book reviews in the magazine. And whilst I do appreciate stylishly designed copy, I have to say that here the new design team has been rather over-indulged and allowed to produce layouts that look like explorations in typography and page design rather than truly serving the interests and tastes of the magazine's audience. "believe me, this book is something special PHILIP ARDAGH"
The winners of the 2011 New Zealand Post Children's Book Awards were announced at an Awards Ceremony in Auckland on Wednesday evening, 18 May 2011. Margaret Mahy and illustrator, David Elliot, have won the country's most prestigious prize for children's literature, The New Zealand Post Children's Book of the Year Award for their picture book, The Moon & Farmer McPhee. 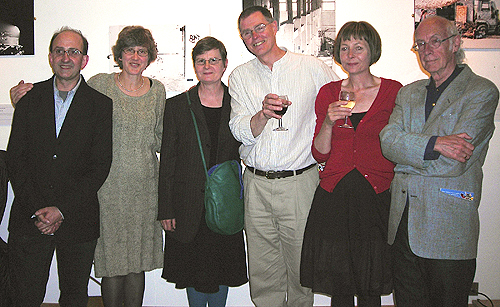 A new Children's Poetry List, published by Janetta Otter-Barry at Frances Lincoln, was launched at The Gallery at Foyles, Charing Cross Road on 17th May with an evening of performances. John Agard (not pictured) also performed a preview of poems from Goldilocks on CCTV which will be published in October. The list's editor, Janetta Otter-Barry, said, "We have many wonderful children's poets in the UK whose voices are not being heard, other than in anthologies. Surprisingly, this also includes established poets. I want to give children the chance to experience the full range of a poet's work in an individual collection. My intention is to publish two books a season, pairing an established poet with a new name. I am very excited about my new venture, which will help to bring poetry back into children's lives." Keren David, holding the 2011 Angus Award presented to her last night for her novel When I Was Joe. 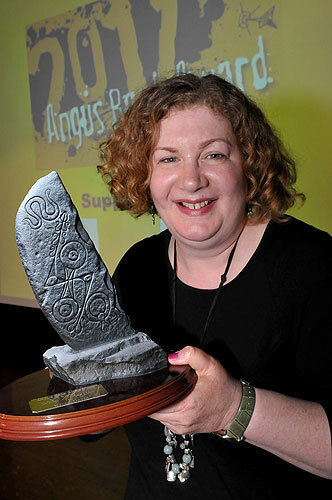 The award ceremony was held at Arbroath Academy and hosted by third year pupils Danielle Dickson and Danny Ford who presented the prize of £500 and the Angus Book Award trophy of the Aberlemno serpent stone to the winning author. 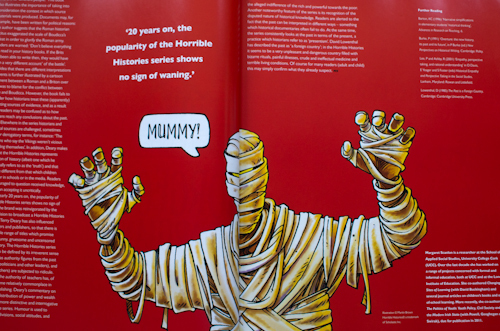 When I Was Joe is also shortlisted for the Branford Boase Award. Sophie Masson is one of the winners from the NSW Premier's Literary Awards. HarperCollins Children's Books has bought two books from Silver Smarties Prize-winning author Jeanne Willis. Editorial director Harriet Wilson bought world rights, including TV, film and merchandising, from Catherine Clarke at Felicity Bryan Associates. The first book in the Penguin Pandemonium series will be published in January 2012. The International Board on Books for Young People has announced the 2012 Jury for the Hans Christian Andersen Awards. The Children's Book Council (CBC) in association with Every Child A Reader, the CBC Foundation, announced the winners of the fourth annual Children's Choice Book Awards at a gala in New York City on May 3rd. Children across the country voted in record numbers for their favorite books, author, and illustrator at bookstores, school libraries, and at www.BookWeekOnline.com, casting over 500,000 votes. Peter Andre Can't Wait - Can You? "I can't say too much but I'm working on some children's books and I can't wait until you can read them. We've come up with a great idea, I think they're going to be fab." The novel follows the experiences of a 15 year old girl, Lina, her mother and brother as they are shipped away to a cruel Arctic winterland. Sepetys makes a compelling case for her story in the book trailer (as she did also when I heard her speak recently at a Puffin event). I was pleased to find that as a novelist, she tells her frequently harrowing story just as compellingly. The only parts that didn't work for me were the italicised sections, which I found distracting and unnecessary. New collective blog launches today, 1st May, set to feature "Susie Day, Leila Rasheed, Cathy Cassidy and Keris Stainton... ...Karen McCombie, Liz Kessler, Cathy Hopkins and many, many more"